Martin Shkreli began live streaming a day after getting out of jail on a $5 million bond. After a busy couple of days being arrested and charged with securities fraud, posting $5 million bail, and losing his job as CEO of Turing Pharmaceuticals, Martin Shkreli unwound by live streaming. On Friday, the former pharmaceutical executive started a YouTube live stream from his apartment. He killed time sitting in front of his computer in a bare white room cluttered with musical instruments and a large TV. 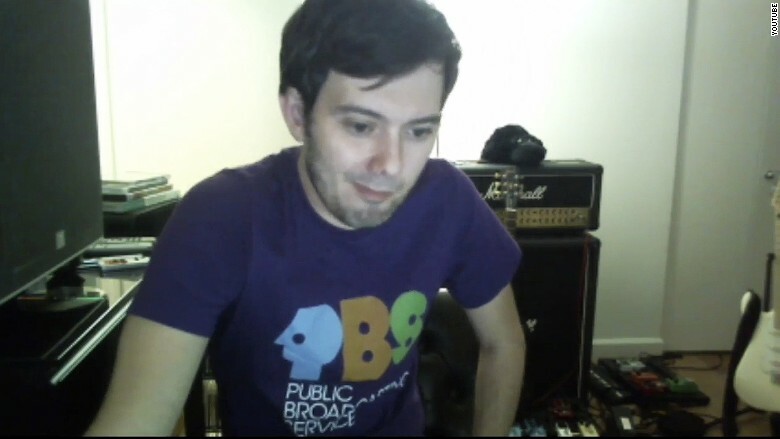 Wearing a purple PBS T-shirt and plaid pajama bottoms, Shkreli, 32, responded to commenters on the stream. Almost 800 people were watching the video at any given time. "It's good to be back," Shkreli said at the beginning of the stream. But within minutes he took a phone call and muted the stream. Hundreds stayed on to watch as Shkreli talked on the phone, left the room, returned, all with no sound. When he wasn't muted, Shkreli said he couldn't talk about the allegations or business, but that he was not hurt at all during his arrest and does not have an ankle tracker. His ex-girlfriend had reached out to show her support, he said, and his mom was doing OK.
Shkreli seemed calm and cheerful as he ignored or banned negative commenters and chatted with supporters. "I'd love to date Lindsey Lohan," he said at one point. "I have a lot of cavities, my teeth are terrible." During the stream, Shkreli updated his Twitter profile to remove his "CEO" title, lost a few games of chess with viewers, compulsively stroked his hair, and strummed on his guitar. Shkreli said he had one drink, but that he was a lightweight. Shkreli rose to fame earlier this year after his company raised the price of drug Daraprim 5,000%. Earlier this month he paid $2 million for the sole copy of new Wu-Tang Clan album, "Once Upon a Time in Shaolin." He has recently made a habit of broadcasting long, random live streams of himself. Some of the streams, which can still be viewed on YouTube, are more than 10 hours long. Asked about his love life on Friday, Shkreli decided to log onto OK Cupid. He shared the profiles he was looking at, including photos, with viewers. "I'm sure my lawyers don't think this is a good idea," he said. As of this writing, Shkreli was still streaming. And single.